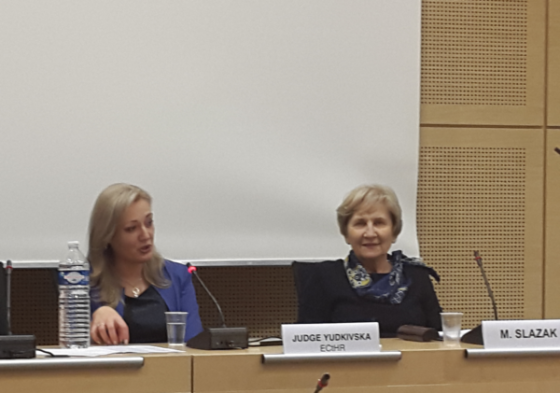 On January 23 – 24, 2018 AEA-EAL President Maria Slazak, in her capacity of past President of Council of Bars and Law Societies of Europe (CCBE), participated as a speaker and chair of the panel in the study visit, organized by Council of Europe for a delegation of alumni of the “International Law in Advocacy” to the Council of Europe and the European Court of Human Rights. The aim of the event was to discuss the role of human rights lawyers, supporting the idea of adoption the proposed European Convention on the Profession of a Lawyer. Maria made an introductory remarks and chaired the session on the role of professional bodies in protection for human rights defenders in the light of new risks and problems in countries of Eastern Partnership. Other sessions moderated by judges of the European Court of Human Rights and experts represented civil society were related to the scope of who is a “lawyer” from perspective of NGOs lawyers (in house and/or independent lawyers) – including disbarred lawyers, the range of protection of professional privilege with a special emphasis on lex specialis guaranties and duties of lawyers, including those related to effective exercise of rights of individual petition via legal representation as well as information on the European enforcement mechanisms for monitoring and protection of lawyers’ rights. Maria was also invited to conclude the conference. The study visit was organized for a group of lawyers from Azerbaijan, Belarus, Georgia, Moldova, Russia and Ukraine by Council of Europe in cooperation with Human Rights House Foundation and CCBE. On January 24, 2018 Maria participated also in a seminar organized by CCBE at the headquarters of the Council of Europe under the title “Threatened lawyers: The end of the rule of law in Europe?” / the aim of the seminar was to present arguments on the need for development and adoption of a European Convention on the Profession of Lawyer/ and in the Parliamentary Assembly where the positive decision to start drafting of the Convention was passed with big majority of votes.